From the heart of the 1950s comes another dose of horrific monsters, unhinged lunatics, rampaging robots, and outer space invaders-the hallmarks of the explosive Atlas Era! Yes, it's a new batch of classics from the time when your comics kept you up at night. 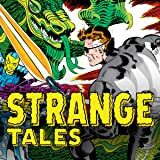 Chock full of stories that run the spectrum of twists, surprises and shocks, Marvel Masterworks: Atlas Era Strange Tales features a host of artistic talent rarely seen a single series! So prepare yourself for just a few of the shocks they have in store for you: Werner Roth will find out whether or not you're made of "Flesh and Blood." Joe Sinnot sets off the "Danger Signal." Like it or not, Paul Reinman will discover whether you're "Man or Beast." John Romita sets his sights on "The Target." And Bill Everett reveals "Karnoff's Plan." 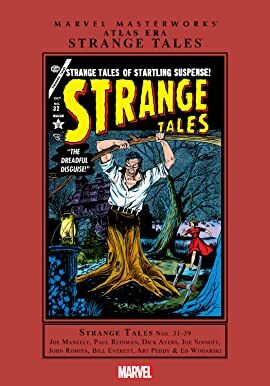 Marvel Masterworks: Atlas Era Strange Tales is a dark trip into the wry and subversive heyday of horror comics that pushed comics hysteria to the breaking point. So why don't you see what all the hubbub was about and come join us for a scare? Read tales of Marvel's most macabre heroes including Doctor Strange as well as some of its grittiest heroes like super-spy Nick Fury, Agent of S.H.I.E.L.D.